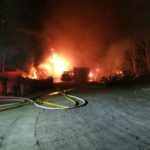 On Sunday February 10 at 11:07 p.m. the Brewster Fire Department was dispatched to a structure fire located at 2318 Route 6 in the Town of Wellfleet. Engine 234 under the direction of Captain Chris Flavell and Car 231 (Chief Moran) responded to the scene on the initial working fire assignment. 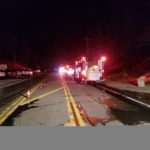 Upon arrival Wellfleet firefighters found a well involved structure and numerous vehicles and excavating equipment on fire threatening a nearby residential structure. Burning embers from the fire were also endangering a church located just south of the complex. Command rapidly requested both second and third alarm assignments and a tanker task force due to no hydrants being in the vicinity of the fire. Initial arriving firefighters stretched several blitz guns and 2 ½ inch attack lines to begin a defensive attack on the fully involved structure. A tanker shuttle and drafting operation was established to provide water to the scene. While at the incident Brewster firefighters assisted with water supply operations, fire attack, and overhaul once the main body of fire was extinguished. The fire was placed under control approximately one hour after arrival. Wellfleet firefighters remained on the scene for several hours on fire watch to ensure the fire was fully extinguished. 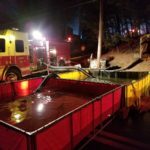 During the incident Brewster Engine 239 provided fire protection coverage in the Town Wellfleet until approximately 5:00 a.m. Due to several diesel fuel tanks and other potential hazardous fuels being involved the Department of Environmental Protection (DEP) was requested to the scene. In addition, the State Fire Marshal was requested to respond to conduct an investigation of the origin and cause of the fire. They were assisted by members of the Wellfleet Police and Fire Departments. There were no reported injuries.